Welcome back readers. It has been a very interesting time since my last update. There has been a lot of volatility in the markets which has led to some great buying opportunities. I made a couple of purchases during January so I was able to take advantage of some of those buying opportunities. This month also provided me with the chance to publish my highest number of articles during one month which I am very proud of. So all and all it has been a very interesting month. So let me break break the month down for you. There were a couple of additions to my portfolio. I chose to strengthen a couple of positions and to start a new one. The 1st month of the quarter is starting to see a little growth. Hopefully I will find some good investments that pay during the 1st month to help this growth even more. 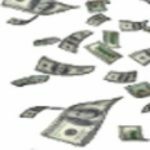 January was the 1st month of Q1 and accounted for $11.24 of my 2018 Dividend Income. 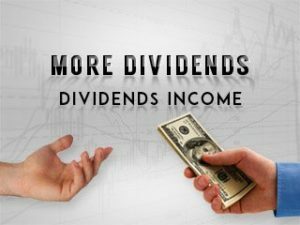 In total during 2018 I have earned $11.24 in dividend income! 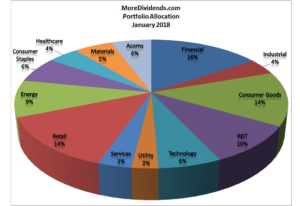 Year over year, I saw a 64.1% increase in dividends earned during the month of January. 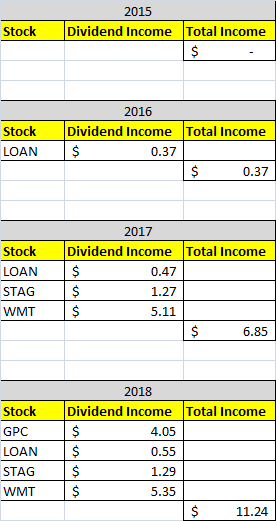 That is some great YOY growth in dividend income received. Hopefully as I grow my dividend income, during the 1st month of the quarter, I will be able to sustain such growth. I added to my positions in the Energy and REIT sectors. I don’t think that I am too allocated to any one sector but I do see some leaders emerging. There are several sectors which I have more holdings in than others. So I may look into some opportunities in some of the other sectors that I am invested in. My portfolio looks a little different this month because of the additions that I made. I am very happy with my portfolio as it stands right now. I will be looking for some more opportunities in the current state of the market because I would love to buy some stocks at bargain prices. This month I published more articles than any other month. This was a good accomplishment for me. I hope to be able to replicate this more in the future. Here are the articles that I posted on here during January from oldest to newest. If you are interested in posting a guest post, just head over to the Contact Page and send me a message. January didn’t represent my highest earning month but it was still a very interesting month. 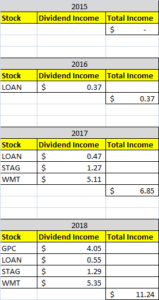 I did see some great growth on my YOY for dividend income received. I would love to see this trend continue into the future. I was able to pick up a couple of good purchases for my portfolio. One of them helped me strengthen one of my positions while the other helped me start a new position in a great company. This month also saw my largest number of published articles in any one month. With so much volatility in the markets lately I will be looking for some more opportunities to buy some more. I am curious to hear of any recent purchases that you all have made. Please share them with me! As always I look forward to reading all of your comments and questions, until then….. happy investing! More Dividends Update from January 2017 Welcome readers. I hope that 2017 has been going good for you so far. Congrats on the increase in dividend income. Thanks DD. It is always nice to hear encouraging words! Thanks for stopping by. Thanks Tom. I didn’t even realize that I had that many until I started typing up this report. My previous best was 8. Hopefully we will both be able to find some good deals. Is there anything in particular that you are looking for? The information contained on this website and from any communication related to this website is for information purposes only. The material on this website does not constitute advice and you should not rely on any material in this website to make (or refrain from making) any decision or take (or refrain from making) any action. We use third-party companies to serve ads and collect non-personally identifiable information (e.g., the pages you visit, and which links you click, which ads you see and click on, and the categories of search terms you enter) when you visit this web site. These companies may use the information outlined above (which does not include your name, address, email address or telephone number) about your visits to this and other web sites in order to provide advertisements about goods and services of interest to you.